The Magazine is putting together a users' history of modern Britain, to run alongside Andrew Marr's television programme A History of Modern Britain on BBC Two. How can you take part? The five decades that followed World War II were a period of huge social, political and cultural change in the UK. An alternative history of post-war Britain is being created, thanks to your written memories, photos and home movies. Thanks for all your submissions so far for the 50s, 60s, 70s and 80s. This week we asked for your recollections of the 1980s and we've already received hundreds of contributions, which will be published on Friday. Now we now want your memories of the 1990s - the decade of New Labour, the dotcom boom, Britpop and the death of Princess Diana. To send us your written memories of a decade, simply fill out the form at the bottom of this page. Your comments may also be used in a separate BBC project called Memoryshare (see internet link right). BBC Memoryshare is an online service where people can post their memories of events against any date between 1900 and the present day. Specifying the date of the memory, if possible, would be very helpful. Got any photos that sum up the 1990s for you? Make the subject line "modern Britain" and explain where and when the picture was taken. 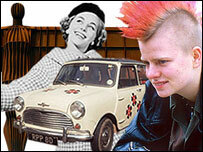 You can now upload your videos of the past to the BBC's modern history group on YouTube. This could be a home video from the decade or an interview today of someone talking about the past. You'll need a YouTube account. If you've not got one, go here and sign up. Your videos need to be on YouTube before you can send them to us. So if they're not already, go to this page and follow the instructions. You need to join our YouTube group, so go here and hit "join this group" on the top right. Now it's time to send us your videos. There's more than one way, but the easiest is to hit the "add to groups" button shown under each YouTube video, select "BBC History of Modern Britain", and hit "add to group". When we approve the videos, they'll appear on this page. So get uploading! If you have any old home movies on cine film, the quickest way to convert them to a digital format would be to project the films on to a blank white wall or screen and record the output on video. Fill as much of the frame as possible. Make sure the video camera is still - don't hand-hold it. Alternatively, you can take your cine film into a photographic specialist in your High Street and pay for it to be converted. Some websites also do the same. If you have VHS you may be able to transfer the film straight into your computer, or specialists can put it on to DVD first. It was the decade of of Blair, Britpop and the death of Princess Diana. Tell us your memories of the 1990s, using the form below.